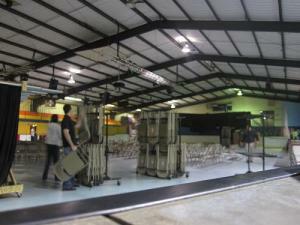 Our Biggest Prayer Service Yet! We’re going to need a bigger room. As I watched the skate rink fill up tonight, I thought, “what are we going to do when we run out of chairs?” What started as a few dozen people has ballooned into a gathering as big as our Sunday mornings. At a prayer service! Special thanks to Berry, our Prayer Pastor, who is truely leading the charge to transforming our city. Our goal has always been to start a movement that will impact our city first and the world next. This is why eLife began with a Prayer Gathering and the services and LifeHouses came later. I’m proud that eLife was started on the principle of prayer. To think it was just 3 years ago our prayer gathering started with 10 people at Chris’s house. Never in our wildest dreams did I think I’d see what I saw today. God is so good! 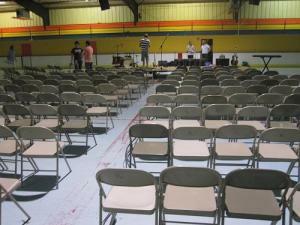 Kelly Hudson and Brandon Gaines set-up 300 chairs for Monday night prayer service. The band gearing up for a full house.